On Thursday, April 16 Mango Moose Media launched the Aero Mexico truck campaign in Montreal. A five truck fleet took off on a 14-week campaign in and around the Montreal downtown core. Each truck contains 3 faces promoting a sunny vacation in Mexico with Aero Mexico. 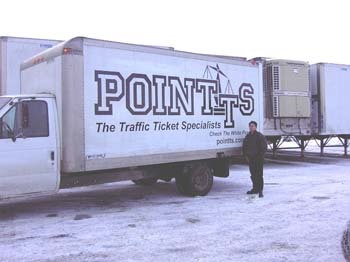 We wrapped 20 trucks for 12 months to let drivers know about Points the Traffic Ticket Specialists. These trucks cruised the streets and the highways, and had a huge reach! 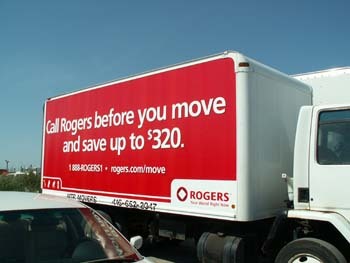 Rogers wanted to let people know that when moving Rogers can make the transition a bit smoother. We put ads on 10 moving trucks for a 4 month period to allow consumers to know of their services. Details: When Labatts wanted to re-launch their Labatt 50 brand of beer they chose an integrated media strategy that consisted of billboards, television, and Truck Side Advertising. 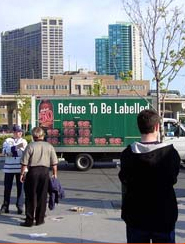 The campaign plastered ads on 20 delivery trucks in the Ontario market with a focus on the GTA region. Extra Mileage: The MangoMoose account team arranged for the Labatt 50 vehicles to be at various sporting events (Maple Leaf and Blue Jay games) as well as had them parked during long-weekends at plazas with Beer stores and major shopping malls.